Bichromal (half-white half-black or any other color) Microspheres, Janus Particles. In this picture - Paramagnetic black microspheres with partial white coating - Magnification 40x. Cospheric offers unique capability to manufacture Janus microspheres and microparticles with partial coatings and dual functionality. Currently half-shell or hemispherical coatings can be applied to any sphere (glass, polymer, ceramic) in sizes 45micron in diameter and higher. Coatings can be customized for any color and coverage of between 20% to 60% of the sphere. Each coating is custom formulated for color, charge, magnetic, electric, and surface properties, and solvent resistance per customers’ needs. 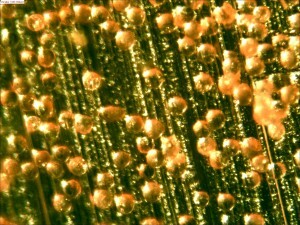 Half-coated glass microspheres - Partial coating on glass particles. 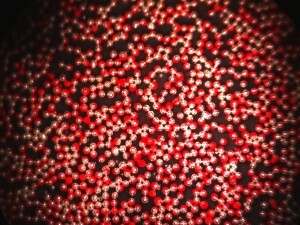 In this picture - Soda lime glass microspheres with partial red coating - Magnification 40x. Hemispherical coatings of less than 1 micron with tolerances as low as 0.25 micron have been routinely demonstrated. Color combinations are truly unlimited. White, black, silver, blue, green, red, yellow, brown, purple as well as transparent microspheres have been made. Sphericity of greater than 90% and custom particle size ranges are offered. We have successfully coated solid and hollow glass microsphere, including soda-lime, borosilicate, and barium titanate glass microspheres. We have also coated on silver. 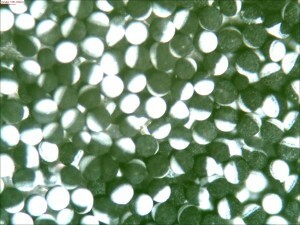 Optically anisotropic spheres and janus particles with magnetic half-shells have been originally developed for applications in electronic displays, such as e-paper, but are now widely used in numerous applications in diagnostics, medical research, microscopy and biotechnology, as well as electronics, due to their ability to orient themselves in response to electromagnetic field and show a visual response. This is achieved by making spheres both bipolar and bichromal, with dipole precisely aligned with two differently colored hemispheres. As the spheres align themselves, the viewer will observe the color of one hemisphere, while the other hemisphere will be hidden from view, providing an obvious strong visible indication of the presence of the field or other stimuli. In alternating electromagnetic field, these microspheres have been proven to spin at hundreds of times per second. Cospheric’s neutrally-buoyant highly charged yellow microspheres have a strong negative charge and are used by scientists in medical technology, biotechnology, applied physics and research. Precise particles with known density of 1.0g/cc that behave in a known way are useful as a model particles in simulation experiments. Particles in a range of diameters from 5micron to 500micron(0.5mm) are currently back in stock. 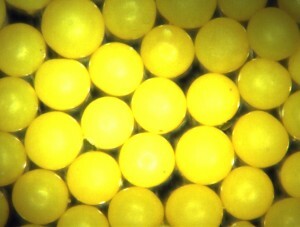 Bright yellow polymer microparticles of high sphericity are spherical polyethylene beads that are specifically designed with density ~1.0g/cc for suspension in fresh water, serving as seed or tracer particles and enabling flow visualization and Particle Image Velocimetry PIV analysis of fluid flow in a device. It is often advantageous to color code the particles by size to better understand which part of the process the spheres of the specific size were able to pass through, or where the contamination in the process is coming from. Microspheres are supplied in dry powder form and are color stable in solution. No solvents are used in the manufacturing process. Polyethylene is inert to most solvents. Cospheric also offers unique capability to manufacture Bichromal janus microspheres and microparticles with partial coatings and potentially dual functionality. Currently half-shell or hemispherical coatings can be applied to any sphere (glass, polymer, ceramic) in sizes 45micron in diameter and higher. Coatings can be customized for any color and coverage of between 20% to 60% of the sphere. Each coating is custom formulated for color, charge, magnetic, electric, and surface properties, and solvent resistance per customers’ needs. Hemispherical coatings of less than 1 micron with tolerances as low as 0.25 micron have been routinely demonstrated. Color combinations are truly unlimited. White, black, silver, blue, green, red, yellow, brown, purple as well as transparent microspheres have been made. Sphericity of greater than 90% and custom particle size ranges are offered. It would be interesting to combine these highly charged yellow microspheres with a partial paramagnetic black coating and investigate the behavior of these spheres in electromagnetic field. Flow Visualization can best be accomplished with colored or fluorescent tracing particles of the same density as the fluid being studied.Particle image velocimetry (PIV) is the term used for imaging the fluid flow using colored tracer particles. Through high speed particle imaging the velocity of the particles can be obtained and mapped. For PIV experiments in water there are a wide variety of 1g/ml microspheres available as seeding particles, Cospheric offers polyethylene seeding particles in a variety of colors (fluorescent and non-fluorescent) and sizes from 10-20um, on up to 1mm. Particle size selection is important to ensure that observations can be accurately made. For imaging systems without any magnification or unaided human observation it is recommended to use micro-spheres that are larger than 200um. Human eyes can resolve features down to about 75um, at 200um+ the particles will be large enough to be discernible. Correctly seeding the system is also important. For most applications loadings of 0.1-0.3% are sufficient. This is the equivalent of about 1 gram of particles per gallon of fluid in systems of 10-50 gallons (40-200 liters) . Exact loading levels will depend on the individual experiment requirements. For aqueous systems, polyethylene micro-particles will require a surfactant to wet properly. For general flow studies pre-wetting the PE microspheres with Simple Green concentrated cleaner works well. For biological systems a bio-compatable surfactant such as Tween 20 or Tween 80 is recommended. Seeding particle color selection is important to ensure that sufficient contrast is achieved during testing. Very bright fluorescent micro-particles are available in densities of 1g/cc these offer not only bright testing under daylight conditions, but also the option of illumination with lasers or uv lights for increased system contrast. The recommended PIV seeding particles are available from Cospheric.